Into a quiet Ohio Amish community a mysterious threat has risen up against one family. The three Hostettler sisters are reaching womanhood at this crucial time. Can they find a path to faith, hope, and love that is not laden with fear? Grace, the oldest sister, has put her rumschpringe (running around years) behind her and has returned to her family, joined the Amish church, and begun a new life. But will she ever confess—even to her fiancé—the secrets that torment her day and night? Ruth, the second oldest sister in the Hostettler family, has one burning desire—to marry and fill her home with children. Life seems to be falling into place until tragedy steals her hope. Can she find the strength and love on which to build new dreams? Martha Hostettler, the youngest sister, is concerned about the continuous attacks being made on her Amish family. When the one she loves appears to have the motive and opportunity, she decides to play detective and clear his name. What will the search for truth cost her? 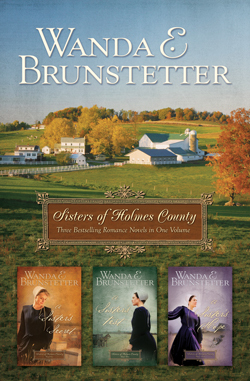 Enjoy a heartfelt look into the lives of an unshakeable Amish family from bestselling author Wanda E. Brunstetter.